Check the weather forecast. Check animal warnings or restrictions within the area. If you are traveling through the parks and hiking it is strongly suggested that you purchase bear spray and bear bangers to help protect encounters with wildlife. Dress accordingly for the weather and pack extra clothing especially for your child, as Canadian Rocky Mountains weather is very changeable. I would recommend during the weekdays as it will be less busy. Trying to aim for an early start (9 a.m.), which will give you plenty of time to walk in and have snacks or lunch at the falls. I would recommend during the summer months. Purchase snacks and food in the larger cities like Calgary or where ever you start your trip. The groceries will be significantly cheaper, along with filling the vehicle up with gas. Alberta, in particular, tends to have cheaper gas prices. Seeing photos of Wapta Falls is one thing but to come through the trees and see the massive waterfall and how much power it has is amazing. Start from the trailhead, which is just off the Trans Canada Highway, and take your time to enjoy the family-friendly, beautiful trail. As you get closer you can hear the loud noise of a waterfall. For the best views of the falls walk down the trail a bit further (steeper section) and step out onto the rocks (little kids should be in a carrier for this). You’ll be rewarded with the most beautiful view of the waterfall and the river below. Find a nice lunch spot by the river and let your kids play in the rocks and mud. Once you are back at the car, drive to the Natural Bridge for a quick stop and marvel at the impressive rock formations carved into the landscapes. Continue down the road to the spectacular Emerald Lake Lodge, where you can eat, hike, canoe and get some great memories. It’s a beautiful spot to watch the sunset, too. Located in Yoho National Park, Wapta Falls is not to be missed. And the hike there is great for kids, especially kids just starting to walk on their own. The trail is not long; it is flat with the odd root crossing over. There are some steeper sections but very doable for all ages. You walk through the tall pine trees where you will start to hear the loud noises of a river and the giant waterfall. You know when you are getting closer. This waterfall is not your typical tall, skinny waterfall. It’s a very wide and short waterfall with serious power. You can view it from above, and you can walk down the steeper trail where you can get to the river bed and walk closer to it. There are tons of spots out in the sun for a nice picnic and an area to throw rocks in the river. DIRECTIONS Wapta Falls is off the Trans Canada Highway. From the junction of Highway 95 and Highway 1, drive east on the Trans Canada Highway for 31.8 kilometers (about 20 miles) to the Wapta Falls trail turnoff. Turn right and drive 1.8 kilometers (about 1 mile) on a gravel road to the parking area at the trailhead. 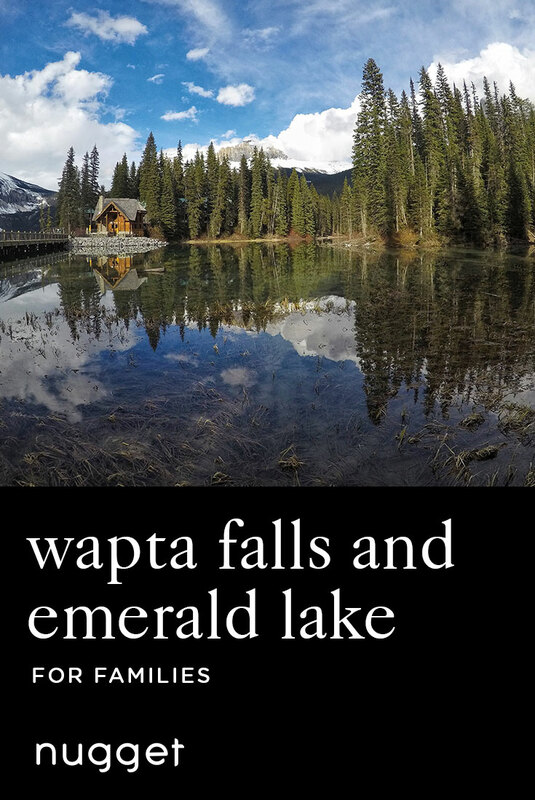 The best thing to do is to use GPS from your car or on your phone to pin Wapta Falls, so you have no issues finding the parking lot. There are signs to Wapta Falls but sometimes you might miss them due to all the natural beauty that is in the area. TIP To get to the river, you will need to leave your stroller up at the top and just hike down with a backpack and your snacks. Natural Bridge is a natural rock formation. It has been sculpted by the erosive forces of rushing water over what had once been a waterfall. DIRECTIONS The Natural Bridge can easily be reached by car just 3 kilometers (1.9 miles) from Field on Emerald Lake Road. It is off the Trans Canada Highway. TIP The Natural Bridge lookout can be visited year-round. Emerald Lake Lodge offers many activities. You can walk around the lake with children, hike up to higher alpine meadow basins or take a canoe ride in the beautiful lake. There are also various trails throughout the valley - something for every skill level. Food options range from the fine-dining Mount Burgess Dining Room to the bistro-style Cilantro on the Lake. Even better, pack a lunch or a small stove to have a picnic at the various tables that are around the lake. DIRECTIONS After checking out The Natural Bridge, continue driving down Emerald Lake Road. Drive safely and watch for wildlife on the road. You will eventually get to the end where you can park.